The EWG (Environmental Working Group) recently released the Dirty Dozen and Clean Fifteen chart for 2015, and I’m thrilled. 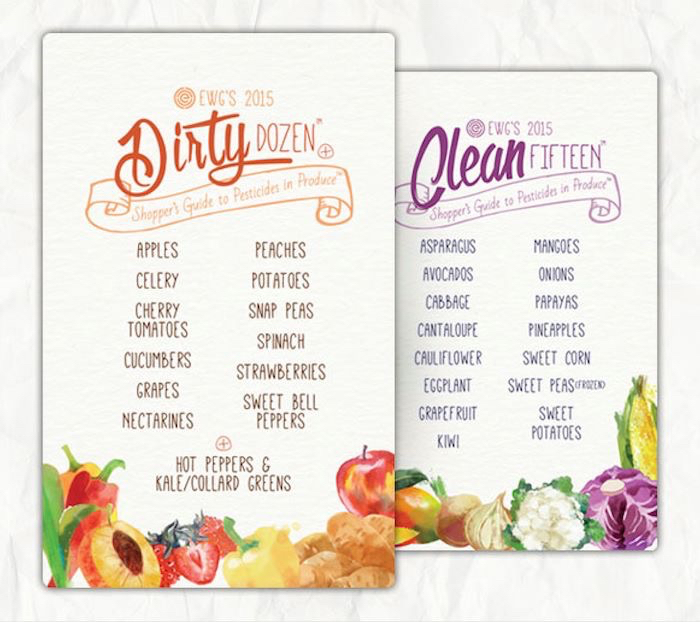 For those that don’t know, the Dirty Dozen are the fruits and vegetables that are sprayed with the most pesticides and should be bought organic if at all possible. The Clean Fifteen are the fifteen fruits and vegetables that are sprayed with the least amount of pesticides, which makes them less harmful and at a lower priority for buying organic. This chart is a practical tool and it represents something that I’m passionate about: you don’t have to have perfect health to be healthy. You don’t need to do it all, buy it all, eat it all, and engage in every single exercise regime. You do need to do the best you can with what you have. Perfectionism runs rampant in the world of health and fitness and I believe it causes a lot of damage. I follow a lot of popular health bloggers on Instagram and many of them present their world as perfectly healthy. Their Instagram feeds are filled with photos of perfect meals, perfect abs (more on why you won’t find that on my Instagram feed later), and a perfect life. There is nothing wrong with presenting the best parts of your life to the world of social media, and I do appreciate the positive messages they are sending out to the world. I appreciate them as role models. But I want to present something different here, in my space that I’m creating for you. In my space, my blog, my sessions with clients and my Instagram feed, I want you to find inspiration for living a healthy, balanced life. I want to show you and my clients that you can have a healthy lifestyle with work, family, and all the stress life throws at us. I want to prove to you that my way of living doesn’t have to be difficult or tedious, and that I don’t miss out on things. It doesn’t have to be everything and it doesn’t have to swallow up things you enjoy. It doesn’t need to be all consuming. If it is all consuming, you are striving too hard for perfectionism, and that is a dangerous path. It doesn’t need to be perfect. Don’t look to me for perfection, because you will not find it. I gave up that goal years ago, after torturing myself to get there and never quite making it. I’ll be very honest with you. It is a struggle for me to let go of not always eating perfect food. For awhile, I would often want to avoid certain situations where the food wasn’t deemed “perfect” in my mind. If it were up to me, if I lived alone, and if I had all the time and money in the world, then I would probably strive to eat perfectly, all the time. I naturally gravitate to that, from years of disordered eating. But you know what? I wasn’t created to live that way and you weren’t either. Sometimes moments in our lives are more important than the food that goes into our mouths. We are hardwired to connect with each other. We crave it and we need it in our lives. And often, these connections happen around food. Family get togethers, birthdays, inviting people over to your house to share a meal, famous recipes handed down through generations. These all have food involved, and if you want to be part of it, you’re going to have to give up your goal of perfection. I have an incredible daughter. She’s almost 4, full of life and ice cream brings her so much joy. I often opt out of ice cream as it’s not a favourite of mine. 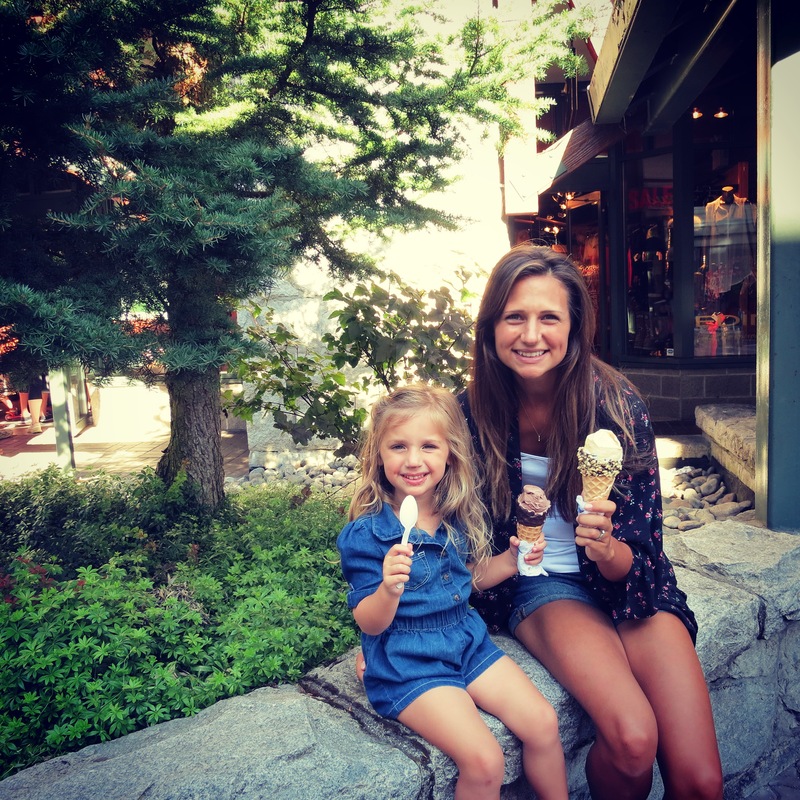 But this past summer we escaped for a family trip to Whistler and when she looked at me and asked me to have some ice cream with her, I could see in her eyes that this moment was important to her. She wanted to have a special moment with her mommy, sitting outside, licking our melting and dripping ice cream and giggling together. I really didn’t want any, but you bet I said yes and enjoyed every bit of it with her. No, I won’t do that every weekend. I won’t say yes every time she wants ice cream. But that day, I honoured the moment with my daughter over my idea of perfect food and perfect health. Back to the EWG list. I appreciate lists like the Dirty Dozen and Clean Fifteen because it leaves room for differences in priority, lifestyle, income, etc. Yes, we would all love to be able to buy everything fresh, perfect and organic, but some of us cannot. This list represents a movement toward doing the best you can, but leaving room for imperfection. I love working out. I really do. I’m one of those weirdos that loves the feeling of sore muscles and I love challenging my body to do things I never thought it could do. I love feeling strong and I love being able to keep up with my energetic kids. However, my workouts are not everything. They do not come first and they do not take priority over my sanity and my overall health. Because I have two children and a part time job, right now my only option for gym time is to wake up and leave my house at 5:30 AM to be home in time for my husband to leave for work. Because that is SO early (and I’m not a morning person! ), I have a rule that I only go if I have had adequate sleep the night before. If I’m not asleep by 10 PM the night before, then I will most often skip the early morning gym time. I believe proper sleep is one of the most important factors in our overall health, so therefore it takes priority over my early morning gym time. I have a “perfect” workout schedule that I aim for each week, but LIFE happens and I just do my best. Struggling to force yourself into a perfect exercise routine can be daunting, frustrating, and make you feel like you want to quit. I enjoy working with my clients to find a way to incorporate exercise into their lives regularly without it needing to be perfect and without it having it completely take over their lives. We are aiming for practical, enjoyable, sustainable exercise. We are not aiming for extreme and all consuming. I want to be clear that I believe there are some limited times when perfection can be attained and can be a positive thing. For example, the Whole 30 program. Following the program requires a very strict way of eating for thirty days, so you can empty your body of all the junk in it, give your hormones a chance to balance out, and kick some strong cravings to the curb. In this case, relaxing on the rules is not beneficial and is actually quite detrimental to your progress and outcome. However, this program is limited to thirty days. It is not promoted as a way to eat forever without any room for special events or special moments in our lives where food is often the common thread bringing us together with our loved ones. In a similar way, some people find that following a strict and “perfect” program for a certain amount of time (often thirty days) is very beneficial to them. Often this can help someone create a good habit and then they are able to eventually make exercise a priority in their life, but not necessarily the top priority, taking over everything else. If this is the kind of lifestyle you’re looking for, then I’m here for you. Find me on Instagram, Twitter, and Facebook, or send me an email. I promise to share my positive but imperfect lifestyle with you, and that includes the good, bad and in-between. If you’re looking for individual coaching, please contact me and I would love to help you find a way to live a life that is full of health and wellness; exercise and good food, but also sleep, stress management, enjoyment and balance. Doesn’t that sound wonderful?